It seems like an old custom for Chinese people to fall asleep anywhere, anytime and anyhow. You will find them sleeping in any position you can imagine. Without any shame, it is part of their culture. Dutch photographer Esther Hessing (Photo Academy Rotterdam 2014) travelled to Yiwu Market in the Hangzhou Region in Eastern China. In this district you will find many factories. These factories sell their products, mostly cheap plastic gifts, in little shops in Yiwu Market. 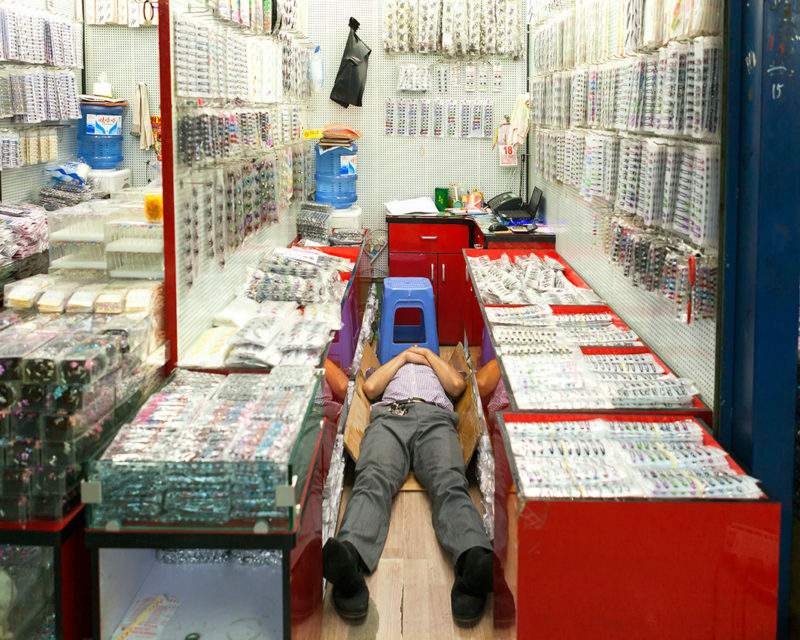 In these shops Hessing photographed people sleeping amidst their goods. On the ground, in a chair, heads on the desk or falling backward. Individual store owners, but sometimes whole families, unhindered by customers or decorum are taking afternoon naps. These scenes form playful images filled with colourful toys. One can only hope these people have dreams that are just as filled with colour. According to Hessing these people have a gift, the natural ability of falling asleep anywhere. As outsiders, we would love to have this gift because it certainly must come with a very peaceful mind.